Student protesters forced an early recess to Thursday's University of California Board of Regents meeting after voicing their concerns over a proposed tuition increase. A two-year deal between Gov. Jerry Brown and UC President Janet Napolitano to not raise tuition expires at the beginning of the next school year, leading to the possibility of a tuition hike starting next fall. UC Chief Financial Officer Nathan Brostrom has proposed a roughly $300 increase, which a system spokeswoman said would affect only one-third of students. 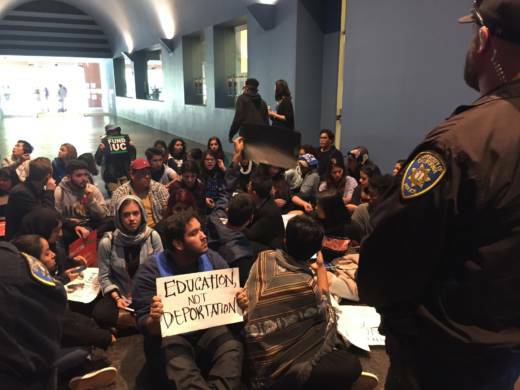 Scores of students from across the UC system began protesting outside the William J. Rutter Center on UCSF's Mission Bay campus, where the regents had convened for their two-day meeting, which began yesterday. Many of them made their way inside the board's meeting just in time for the regents to take up a discussion titled, "Access, Affordability, and Excellence: The Role of Undergraduate Financial Aid and Tuition." Students repeatedly interrupted Brostrom with comments as he told the board that more than half of UC students pay no tuition and that tuition is the top source of financial aid. "This notion that tuition hurts low-income students is absolutely false," Brostrom said. Multiple regents voiced their opposition to raising tuition and asked to see more specific data broken down by campus. "I think it's very clear, by the people sitting in this audience and by the comments that have been made by this board, that there is not going to be tremendous support for a tuition increase," said Regent Norman Pattiz. The average cost of attendance this year at UC for an undergraduate student living off campus comes in at around $30,000. That includes $13,500 for tuition and fees, with additional costs for books, health care and housing. "We can celebrate our diversity on pie charts and pamphlets," said student regent-designate Paul Monge, referring to Brostrom's presentation, "but when we consider proposals like tuition increases, we threaten that very diversity that we claim to value." When Vice-Chair Bonnie Reiss tried to move on from the discussion, students began chanting. Regent John Pérez proposed reopening public comment to allow the students to share their thoughts, but Reiss eventually asked police to clear the room after the demonstrators continued to speak out. Police gave students five minutes to leave the meeting room and were successful only after intervention by Monge and student regent Marcela Ramirez. Some students refused to leave the building, staging a sit-in in the lobby surrounded by police for more than an hour. The students eventually left after talking with Pérez, who they say promised to set up meetings for regents to visit campuses and continue the conversation. "I think it's saddening that at the end of the day, when we try to engage the people who are supposed to be accountable to us in a conversation, they run away from us," said Semi Cole, a third-year student at UC Riverside who helped organize the protest. Dellanira Alcauter, a third-year student at UC San Diego, said students of color and others without extensive financial resources will be hardest hit by a potential tuition hike. "[The regents] clearly have no respect for us. They clearly have no respect for our lives. They clearly have no respect for the struggles we face day to day." A board spokeswoman said regents will vote on the budget in January and that no decisions on raising tuition have been made.